Successfully Added Double DIN 6.2 Inch Car DVD Player "Road Rampage" - Touch Screen, GPS, Bluetooth to your Shopping Cart. Double DIN 6.2 Inch Car DVD Player with a resistive touch screen, GPS and Bluetooth connectivity is a great wholesale priced in-car entertainment system that offers all the latest features. 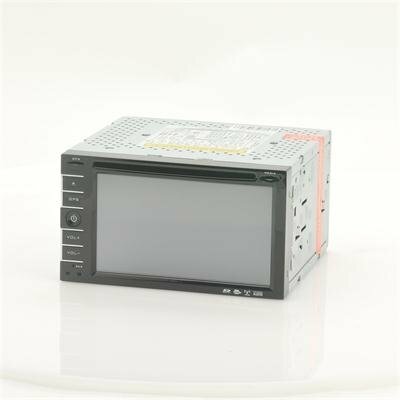 Tear up the highway and mow down the competition with this 2 DIN car DVD player, also known as the “Road Rampage” with a 6.2 inch screen. This “Road Rampage” 6.2 Inch Touch Screen Car DVD Player features an amazing 800x480 pixel screen resolution to make disks and videos played on this remarkable system come out crystal clear and visually radiant. It handles the Internet's most popular video and audio file formats like AVI, WAV and MP3 with little burden. Accompanying this DVD player for cars is a remote control therefore the music volume or song can be changed via passengers in the back of the vehicle. As a result of the Bluetooth function, you can easily sync your phone to this car DVD player and make phone calls with your hands on the steering wheel. The powerful GPS navigation system running on Windows CE 6.0, which is currently one of the best GPS running operating system features lane assist, voice guidance, 3D views, intelligent route planning, points of interest (POI) notifications and more. There is also the standard AM and FM radio receiver as well as the Ability to play CDs, however new extras include the ability to attach your iPod so you can play music directly from your iPod player through your car speakers. Become fast and furious with this 6.2 inch “Road Rampage” car DVD player and bring your dash board to life. This product is in stock and can be dispatched within 24 hours of ordering with a 12 month warranty. Brought to you by the leaders in wholesale electronics and car DVD players, Chinavasion. fits perfectly inside 2din slots, looks just like factory installed.